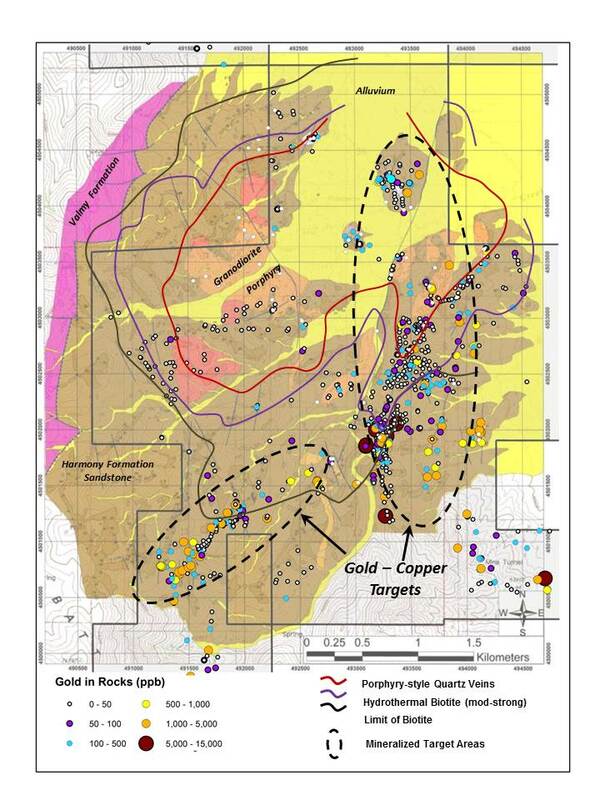 Coeur d’Alene, Idaho – June 18, 2018 – Timberline Resources Corporation (OTCQB: TLRS; TSX-V: TBR) (“Timberline” or the “Company”) announced today that geologic mapping, surface sampling, and an aeromagnetic survey have defined a large porphyry copper target on the Elder Creek project in the Battle Mountain District of Nevada. Timberline has entered into a purchase and sale agreement with Americas Gold Exploration, Inc. pursuant to which it may obtain the right to acquire a 65% interest in the 41 km2 property by spending US$5.1 million over 6 years through an earn-in joint venture agreement wiith McEwen Mining Inc. Additional details of the transaction are available in a previous new release dated May 24, 2018 at http://timberlineresources.co/press-releases. Rock geochemical sampling results (Table 1), along with geologic (Figures 1 and 2), and geophysical (Figure 3) characteristics evident at Elder Creek are common to major porphyry copper deposits. The core of the Elder Creek porphyry target (Figure 1) covers approximately 4.5 sq km, and has at least three intrusive phases which form two granodiorite porphyry centers that are similar in age (35-37 million years) to the intrusive rocks at Newmont’s Phoenix gold-copper mine 18 km to the south. The core is charactertized by intense quartz veining and elevated copper and molybdenum values, and is flanked by proximal potassic alteration and distal biotite-pyrite-pyrrhotite hornfels. The porphyry core forms a pronounced magnetic low that is ringed by a strongly magnetic high “donut” (Figure 3) of hornfels. Large target areas of gold-copper veining occur within the hornfels to the south and east of the porphyry core. Most of the approximately 100 historic drill holes are less than 150 meters deep and tested some of the areas of polymetallic veining within the hornfels on the eastern portion of the property and encountered multiple intercepts of both copper oxide and sulphide, and gold mineralization. 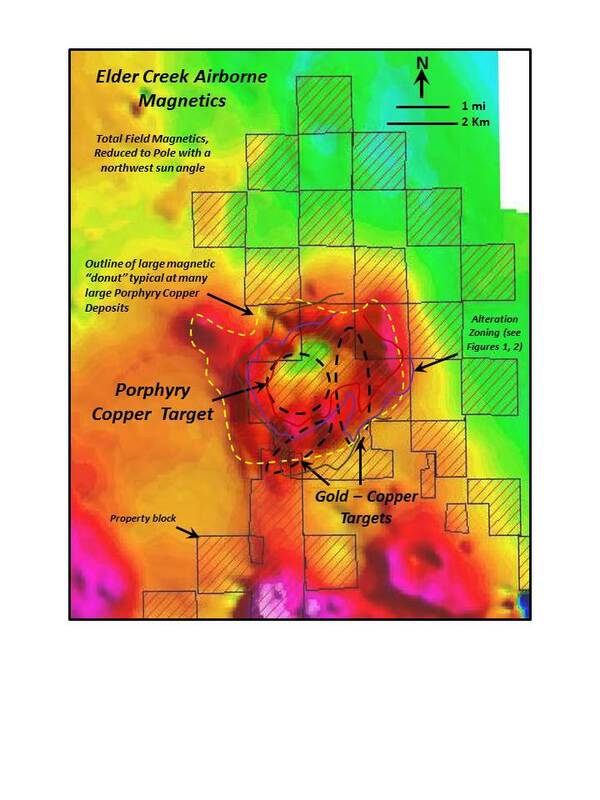 Only two shallow holes were drilled in the main porphyry copper target area, leaving it relatively untested both areally and to depth. The Company recently collected twelve (12) surface grab samples to complement 41 rock samples collected in 2013 (Table 1) across the Elder Creek project area (Figures 1 and 2). Twenty-five (25) of the samples contain elevated copper mineralization (>1,000 ppm), with thirteen (13) of those over 1% copper (>10,000 ppm) and reaching a maximum of 17% in a sample taken from a copper-oxide mineralized outcrop. Gold assays in excess of 1 gram per tonne (g/t) (1,000 ppb) were also noted in multiple locations, with elevated levels of indicator minerals, including bismuth, molybdenum, and arsenic, present in many samples as well. These assay results corroborate those from over 1,100 rock samples that have been documented from the same area, including numerous duplicate samples from individual outcrops. Additional metallogenic associations, together with the Company’s new interpretive exploration models are presented and further described at http://timberlineresources.co/projects/ElderCreek. 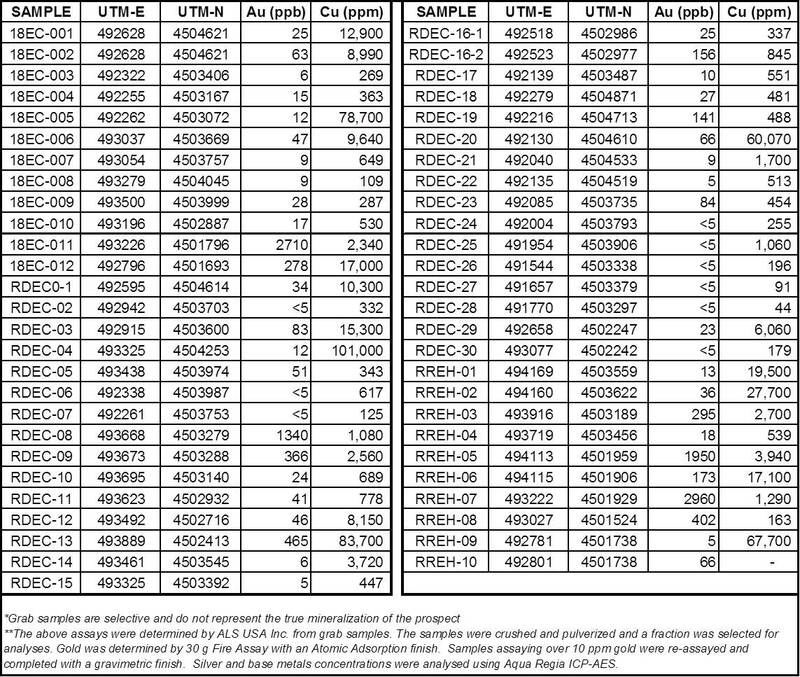 Apart from recent sampling disclosed in Table 1, all other geochemical data is considered “historical” and does not conform to NI 43-101 standards. These data include historical drill information for which assay certificates from industry standard laboratories are available and compiled in a database including UTM coordinates for each sample site. UTM sample location coordinates are also available for all historic rock grab samples from which a representative group have been field verified. Mr. Osterberg continued, “Most of the project area remains completely untested by drilling. Under-tested targets of this magnitude are rare in established, world-class mining jurisdictions such as Nevada’s Battle Mountain District, and we intend to test the vast exploration opportunity at the Elder Creek project”. The Company is continuing its review of historical exploration data, including approximately 14,100 soil samples collected by previous explorers of the property, and results from approximately 100 historic drill holes. Historical geophysical data including gravity and IP/Resistivity data are currently being re-evaluated in the context of the current geologic model. Exploration plans include completion of additional geophysical surveys to better assess distribution of sulphide mineralization, continued geologic mapping, and an initial fence of drill holes across priority targets, including copper oxide mineralization identified in outcrops. Further technical details of the Elder Creek project may be viewed at: http://timberlineresources.co/projects/ElderCreek. Timberline Resources Corporation is focused on advancing district-scale gold exploration and development projects in Nevada, including its 23 square-mile Eureka property, comprised of the Lookout Mountain, Windfall, and Oswego projects which lie along three separate structural stratigraphic trends defined by distinct geochemical gold anomalies; and as operator of two joint venture projects – the Paiute project joint venture with a subsidiary of Barrick Gold, and the Elder Creek project joint venture with McEwen Mining. All of these properties lie on the prolific Battle Mountain-Eureka gold trend. Timberline also owns the Seven Troughs property in northern Nevada, known to be one of the state’s highest grade, former producers. Timberline has increased its owned and controlled mineral rights in Nevada to over 43 square miles (24,500 acres). Detailed maps and NI 43-101 estimated resource information for the Eureka property may be viewed at http://timberlineresources.co/. Cautionary note to U.S. investors concerning estimates of resources: This press release may use the terms “resources”, “measured resources”, “indicated resources”, “inferred resources” and “measured & indicated resources.” We advise U.S. investors that while these terms are defined in and required by Canadian regulations, these terms are not defined terms under United States Securities and Exchange Commission (“SEC”) Industry Guide 7 and are normally not permitted to be used in reports and registration statements filed with the SEC. The SEC normally only permits issuers to report mineralization that does not constitute SEC Industry Guide 7 compliant “reserves” as in-place tonnage and grade without reference to unit measures. U.S. investors are cautioned not to assume that any part or all of mineral deposits in these categories will ever be converted into SEC Industry Guide 7 reserves. Statements contained herein that are not based upon current or historical fact are forward-looking in nature and constitute forward-looking statements within the meaning of Section 27A of the Securities Act of 1933 and Section 21E of the Securities Exchange Act of 1934. Such forward-looking statements reflect the Company’s expectations about its future operating results, performance and opportunities that involve substantial risks and uncertainties. 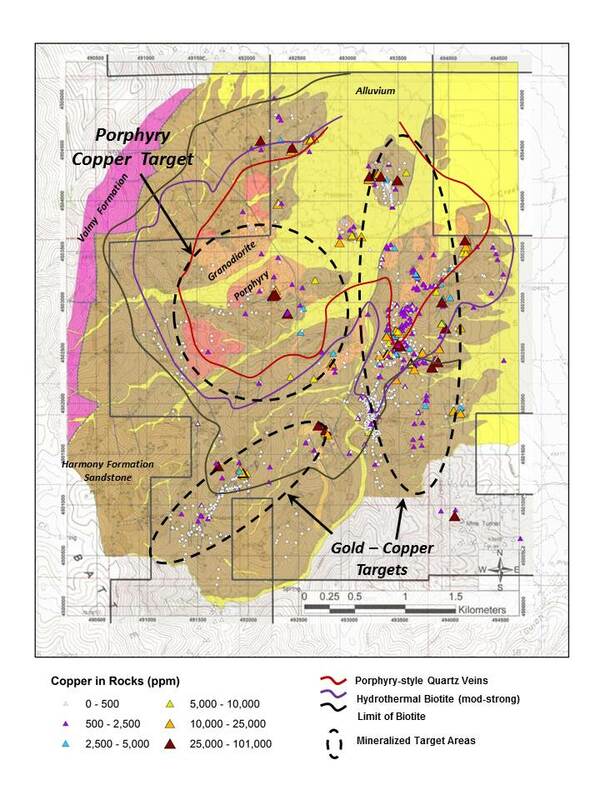 These statements include but are not limited to statements regarding confirmation of the presence of porphyry copper and copper-gold targets of substantial size located in the Elder Creek project area which are similar to that at Newmont’s Copper Basin Project, and testing targets with initial drilling to follow-up on the historical results. References to Newmont’s Phoenix mine are for information only and there are no assuances that the Company will achieve the same results at Elder Creek. When used herein, the words “anticipate,” “believe,” “estimate,” “upcoming,” “plan,” “target”, “intend” and “expect” and similar expressions, as they relate to Timberline Resources Corporation, its subsidiaries, or its management, are intended to identify such forward-looking statements. These forward-looking statements are based on information currently available to the Company and are subject to a number of risks, uncertainties, and other factors that could cause the Company’s actual results, performance, prospects, and opportunities to differ materially from those expressed in, or implied by, these forward-looking statements. The Company’s earn-in to the Elder Creek project joint venture has not yet closed, there are a number of conditions precedent to such closing, and there are no assurances that the Company will complete the earn-in as contemplated or at all. Factors that could cause or contribute to such differences include, but are not limited to, risks related to changes in the Company’s business and other factors, including risk factors discussed in the Company’s Annual Report on Form 10-K for the year ended September 30, 2017. Except as required by law, the Company does not undertake any obligation to release publicly any revisions to any forward-looking statements.